To find out about the award sites, click on their logos. Photo of the Week. 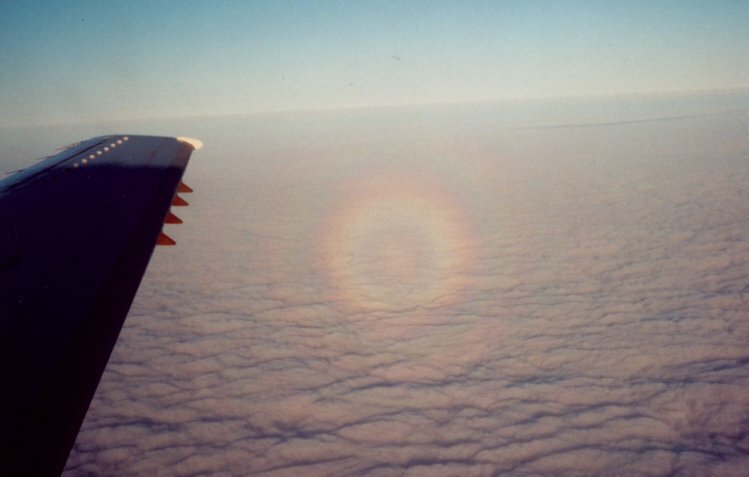 A "glory," caused by the diffraction and interference of light waves from sunlight, produces multiple colored rings around the shadow of an airplane projected against the clouds below (the shadow too small to be seen here). Astronomy news for the week starting Friday, April 12, 2002. The week begins with the new Moon, which takes place on Friday, April 12th, about noon in the Americas. The evening of Saturday the 14th, the slim crescent will be seen in evening western twilight as it makes a particularly nice pass three degrees to the south of brilliant Venus in a near- classic "crescent and evening star" appearance. The sight will be obvious just after sundown, as unmistakable Venus leads the way. Be sure to look while the sky is still light. If you miss that one, the next night is in its way just as good. On Monday the 15th, the growing crescent passes only two degrees south of Mars. While Mars, to the east of Venus, is much less bright, the passage will be visible in a darker sky, and the Earthlight on the nighttime side of the lunar disk will glow prominently. Moreover, Mars and the Moon will appear nicely to the left of the lovely Pleiades cluster in Taurus. And if you miss that one, you can still catch the crescent on top of Saturn the following night, Tuesday the 16th, the Moon having passed the planet in the afternoon of the same day. Here we see a wonderful combination of Saturn, the Moon, and the Hyades of Taurus, against which glows the soft orange light of the star Aldebaran. The night of Wednesday, the 17th, the Moon will then appear to the west of Jupiter, still in Gemini, and the following night, on Thursday the 18th, to the east of the giant planet. After its rendezvous with the four bright planets, the Moon finally makes it to first quarter on Saturday the 20th. These successive planetary passages show how much the bright planets are gathering together for an even tighter grouping in late April and early May, when even little Mercury will get into the act. The morning sky is graced by Comet Ikeya-Zhang, which during the week passes below Cassiopeia and into Cepheus. Though visible to the naked eye, it is best to use binoculars. While the winter stars slip ever-farther into the west, where they will meld with twilight, the spring stars gather their evening strength. By 9 PM Daylight Time, those in the mid north will see the Big Dipper approaching the overhead point. To the south, Leo (the Lion, with its prominent "Sickle" figure that ends in bright Regulus), approaches the meridian, while to the south and a bit to the west of Regulus lies lonely Alphard in the neck of Hydra, the Water Serpent, which takes hours to wend its way around the sky. Far below them are Vela, the Sails of Argo. In between in a dark sky are two of the dimmest of the constellations, obscure modern Pyxis, the Compass (affiliated in modern times to ancient Argo) and one of the odder celestial offerings, Antlia, the Air Pump, which is also of obvious modern origins, the ancients not employing such devices (showing that we make constellations from the things that are familiar to us).